"A decade ago, when Pitsiladis began to study elite athletes, his medical students would ask why East Africans dominate distance running, to which he would reflexively respond that their secret is in their genes. 'But after 10 years of work,' he says, 'I have to say that this is a socioeconomic phenomenon we're looking at.' "
- Quote from a Sports Illustrated article from former Columbia 800 runner David Epstein about genetics in sport that says Ethiopians and Kenyans couldn't be more different genetically and that a random medical student can have more "sprinting genes" than Asafa Powell or Usain Bolt. BBC reports Charlie Francis, White, 61, dead from Cancer. 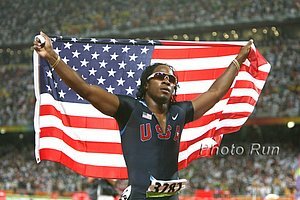 He coached Marion Jones, Tim Montgomery, Ben Johnson. Recommended Read #1: Mike Hurst - A Personal Perspective On Coach Charlie Francis A great read from a friend of Francis titled: "End of good run for flawed coach". 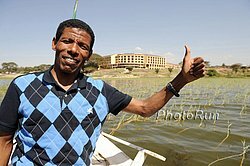 Haile Gebrselassie Racing BUPA Great Manchester Run This Sunday Though he isn't racing anyone of his caliber, Gebrselassie says this race will help him determine whether to run his fall marathon in Berlin or Chicago. *Florida Hoping To Win Both Titles It would be a triple crown for the Gator women. Kara Goucher 4 Months Pregnant And Training With Pregnant Paula Radcliffe Things are going well when your pregnancy is announced in the NY Times. Radcliffe and Goucher are due on the same day. Cornell Men Nab Record 8th Straight Outdoor Heps Underdogs heading to Princeton's home track, the Big Red men took home another title to keep the streak alive. The Cornell women also got back on the winning track after their streak was broken in 2009. Props to Hepstrack.com and Brett Hoover, who provided phenomenal coverage of the meet, and the Princeton students at Fauxtrack, who streamed it live via ustream.tv. 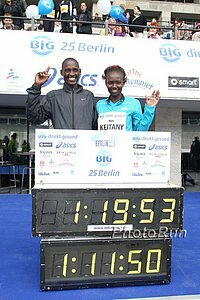 They proved everything (except World Cross-Country), including our beloved Heps, can be streamed online these days for free. Walter Dix Is Back: Runs 9.98 And 19.89 And apparently the whole meet was run in 90 minutes. If anyone knows anything about this, let us know, but a big Thumbs Up to FSU for trying to make an entertaining track meet for fans. Andrew Carlson, Katie McGregor Win US Titles Carlson was the US 15k champ in 2008 and is back running well again, although the 25k champs is an easier championship to win. Doha Launches Diamond League Friday Distance highlights include phenom David Rudisha vs. Asbel Kiprop and world champ Mulaudzi in the 800, great men's steeplechase, Joseph Ebuya in the 3000 or 5000 (depending on the temp.) and Burka/Jamal in women's 1500. *9:30pm on Universal TV for US viewers. Allyson Felix Speaks Out On LaShawn Merritt, Marion Jones, Justin Gatlin Preacher's daughter wants to become a part of President Obama's administration. Drug Cheat Marion Jones Talks With Britain's Telegraph About New Basketball Career Jones hopes her story is an inspiration to others. Lamine Diack Promises Semenya Decision By End Of June Says confidentiality had to be his priority after story got out in the public. Anna Pierce and David Torrence Win US 1 Mile Road Champs Torrence ran around the streets with an American flag and black socks after he took it to the field in the last 200m as Lopez Lomong was left in 6th. Sarah Bowman came up to pass race leader Christin Wurth-Thomas for 2nd but nobody could match Pierce. Khalid Khannouchi Returns Against Stiff NYC Healthy Kidney 10k Field If you want to know what Khannouchi has been up to, check out this article. Good Read: Brief Chat With Paula Radcliffe's New BFF Kara Goucher Kara talks about training with her new mentor Paula, using the Alter-G to train with a growing baby, Alberto's searching for expert advice on health effects of training while pregnant, and her plans next year that include the Boston Marathon and Oly Trials. Not A Joke Headline: "Goucher and Radcliffe to give birth on the same day"
WRs For Sammy Kosgei And Mary Keitany At BIG Berlin 25 According to the McMillan Calculator, Keitany's time of 1:19:53 is equivalent to a sub-2:20 marathon and a half marathon of 1:06:22, which would be a WR.